Great for stirring sauces, soups, and so much more, this 16" wooden spoon is an indispensible kitchen tool, essential for everyday use! Made of durable rubberwood and featuring a 3/8" diameter handle, this spoon is perfect for mixing thick dough and batters, fudge, frosting, and other culinary and confectionary creations. The broad and oval concave bowl enables thorough mixing, stirring, and tossing of ingredients during food preparation, while the smooth edges and sanded surface ensure a quality product for your kitchen's use. My second favorite spoon from this collection, has the length to really get in there and take care of business, I'd recommend the 16" wooden spoon. Many long spoons do not have sturdy enough handles to hold up to stirring thick foods. This one does. I would have happily paid more for this spoon. the 16" wooden spoon is a kitchen classic, tried and true. the craftsmanship of this product is great, nice smooth edges and is able to take a beating from pounding on the sauce pot rim. I'm an old school from scratch baker, and have found this wonderful wooden spoon to be just what I needed when mixing rather large batches of cookie dough. I mix dry ingredients into the creamed butter and sugar so that the dough is not over worked. This has been invaluable! 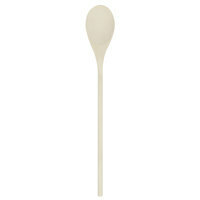 Extra long handled wooden spoon works great in larger pots for soups or sauces. It came lacking any splinters or blemishes, which is certainly rare for wooden cookware. Highly recommend ordering a lot for your kitchen. Another must have item that you can find in any kitchen. This spoon has a nice long handle which makes it perfect for deep pots. This 16 inch wooden spoon is very sturdy and has a nice long handle perfect for deep pots or stirring drinks in a pitcher. Great addition to your kitchen! I love the versatility of wooden spoons. They don't scratch the bottom of your pans and are easy to use. These are sturdy and such a great value! This is a great, sturdy wooden spoon. My kids made juice and used it to stir in our tall one gallon pitcher. I would buy again. The spoon is a good deal. The size and handle feel good in the hand, it works well, and the price is excellent. I like the length, because it gives you a long handle, but one that still feels maneuverable. A wonderful long (16 inches) spoon, it is made of wood. Sturdy, it can support heavy ingredients. This spoon is one that can last a very long time. I hate getting these from webstraunt because they usually have a paper sticker on them you have to remove. This one had three. You have to soak them overnight to get them off. This 16 inch wooden spoon is perfect for larger pots. The wood construction will ensure that your nonstick cookware remain safe even if the wooden spoon touches the surface. We like having many wooden spoons in our inventory. Huge wooden spoon perfect for large stock pots and pans. Perfect size for webstaurant item number 9223902, the 7 qt sauce pan. We use it for pasta, but it's great for anything when you're cooking large quantities. If you need a bunch of affordable, yet good quality spoons, then look no further. These are great for the price. Easy to clean and the wood is smooth. This is a great long handled wooden spoon for salads or stirring or any cooking on a non stick surface since it will not scrape a pan. It is lovely for sauce or curry but it will stain with the color of the spices and food you are cooking--which actually looks pretty neat! The 16 inch wooden spoon is very good for stirring pasta and making rice crispies in a pot. I was also happy that it was surprisingly easy to clean. This sixteen inch wooden spoon is perfect for large mixing bowls. I use this size with fifteen to twenty quart mixing bowls for things like triple layer cakes and large brownie batches. The spoon has a good amount of flexibility and firmness to allow for easy mixing. I found it cleans well and shows no sign of wear. I would recommend this spoon. The 16" Wooden Spoon works very well and I don't have to worry about it getting lost in my pot with the long length. The quality is good and the price is as well. I highly recommend this spoon. This one is good for stirring those tall posts and things. It is a good product. It is well made and it seems very sturdy. The longest spoon we own, and it allows us to mix from the bottom of the bowl to make sure all ingredients are fully incorporated without risking it breaking because it is built really strong. Exactly as described. The quality is high and they do not dry out after daily washing and drying. Good pricing and fast reasonable shipping. What more could you ask for? This 16 inch wooden spoon is definitely one of the best wooden spoons I have ever owned. I don't see it ever breaking any time soon. Like other ones have. I will definitely buy again. Great product for a great price, I wasn't sure what to expect when I ordered it but the spoons are sturdy amd smooth. At this price I can afford to get tmultiple sizes. Great spoon with a long handle that is perfect for deep pots. It is nicely priced and definitely worth a try. I recommend to anyone who is interested. This is a great wooden spoon for the price. It's very smooth unlike other budget offerings but could still benefit from some mineral oil to prevent it from drying out. this extra long 16" Wooden Spoon super amazing especially for a very hot item on the stove which is great to have that long handle. great buy! It is not too long or too short to make a large bowl of potato salad for the family get-together. The long handle allows one to stir without losing control of the spoon or touching the contents of the container. This is a great quality wooden spoon. It is really long though, so be prepared for that. I've had no problems with my splintering. The wood seems to be good quality. The 16" wooden spoon is made of beachwood, which doesn't lend a nasty taste to your food. It has no coating, so overtime it needs to be watched so it doesn't fray. You can always use more wooden spoons, right? No issues with this, I mean it's just a wooden spoon but it didn't break yet so that is good. This 16" wooden spoon is a nice spoon for stirring sauces. It is easy to hold and clean. The wooden spoon is sturdy and will not break easy. good price. I like this 16" wooden spoon. It is just a basic wooden spoon, which you can never have too many of. Overall, i would recommend this product. Great wooden spoon. Haven't been using as frequently as the 12" but I've owned both for about 5 months now and both haven't split or started splintering like some other spoons I owned. Great value. Good quality spoon for a very attractive price. No rough spots or splinters like cheapo dollar store spoons. 3-4 coats of mineral oil keeps stains at bay and makes cleanup a snap. This 16" wooden spoon is a great tool for the kitchen. We use them for mixing sauces and soups. I bought several to also use for mixing doughs and batters for the bakery. I love my spoons. They reach all the way into the pot and mix up stuff really well. I have been looking all over and now I have them in different sizes.